The logo of the WCC 10th Assembly is available in a full-colour, vertical base format. The full-colour base logo is the first logo version to be considered for any use. To adapt to some special needs, a landscape version as well as grey-scale, black-only and "negative-state" white-only versions can be obtained from the WCC Communications department. The logo is a graphic entity and should be used with the text identifying it as the logo of the WCC 10th Assembly, with the venue and dates. Do not change the colour of the logo or change or remove any of its components. If you wish to create additional language versions, please contact the WCC Communications department. The logo should always be used to communicate and promote the WCC 10th Assembly, and should be used on all related documents and publications. 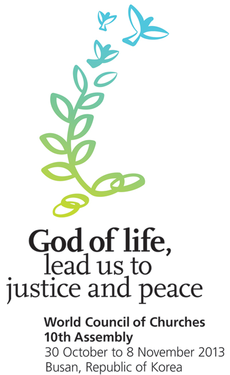 The logo may be used by the assembly office, member churches, ecumenical councils and other partner organizations.